I’ve never been a big cheesecake maker because of the work involved. Making the crust, carefully beating the eggs and cream cheese for the filling, and baking in a water bath. No thanks and with this recipe, you don’t have to do any of that. It’s impossibly easy. The cheesecake is creamy, rich, luscious, and the texture reminds me of New York-style cheesecake. The batter is made in the blender and it’s virtually impossible to screw up. I love blender batters. To sweeten the deal, you don’t have to make a crust because it miraculously develops as the cheesecake bakes. The recipe uses an ingredient you’d never guess: Original Bisquick™ mix. Bisquick is the key ingredient for easy recipes like this that you can make ahead of time so you can spend holidays with your friends and family and not in the kitchen. You’d never suspect the cheesecake is made with Bisquick and wait until you tell someone as they’re enjoying a decadent bite of cheesecake that it’s made with pancake mix. The look on their face is priceless. I recently made Easy 4-Ingredient Perfect Peanut Butter Cookies with Bisquick and was highly skeptical going into either that recipe or this one that they’d work and taste great, but I’m now a Bisquick believer. After baking, the cheesecake is topped with a sweet-yet-tangy sour cream (or Greek yogurt) glaze. The glaze adds flavor and moisture and I think all cheesecakes benefit from a sauce to balance the texture. 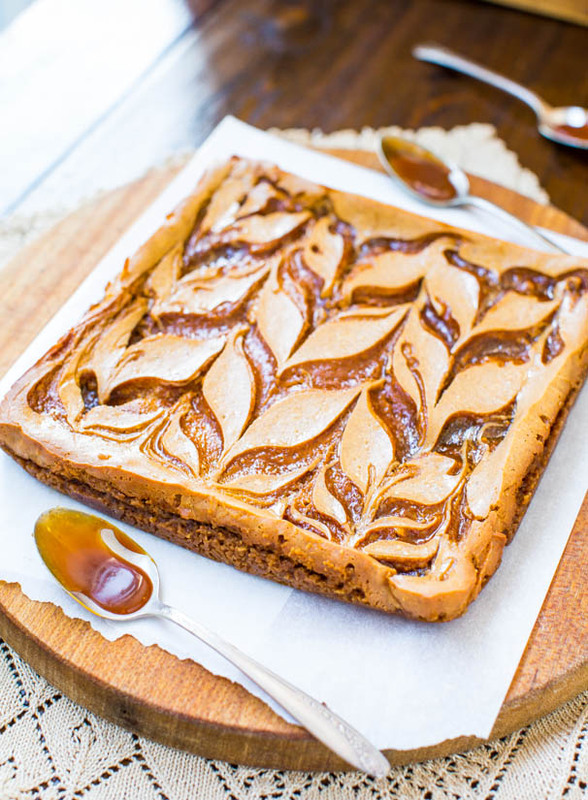 I couldn’t resist topping it with chopped chocolate, or try fruit or salted caramel. You can make the cheesecake a few days in advance and keep it refrigerated until you’re ready to serve it. I love make-ahead desserts because it’s one less thing to do the day of an event, party, or special dinner at home. Knowing this is waiting for you in the fridge is the best feeling. The cheesecake is creamy, rich, luscious, and the texture reminds me of New York-style cheesecake. 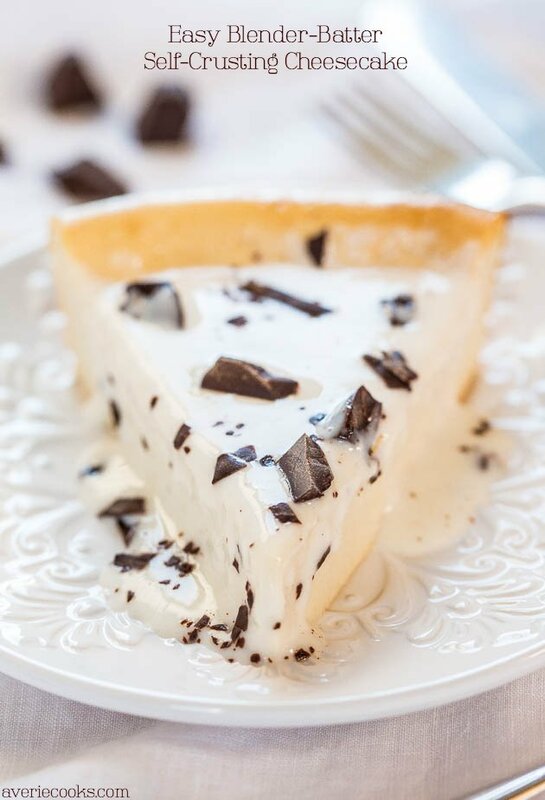 The batter is made in the blender and it’s virtually impossible to screw up.To sweeten the deal, you don’t have to make a crust because it miraculously develops as the cheesecake bakes. The recipe uses an ingredient you’d never guess: Original Bisquick™ mix. 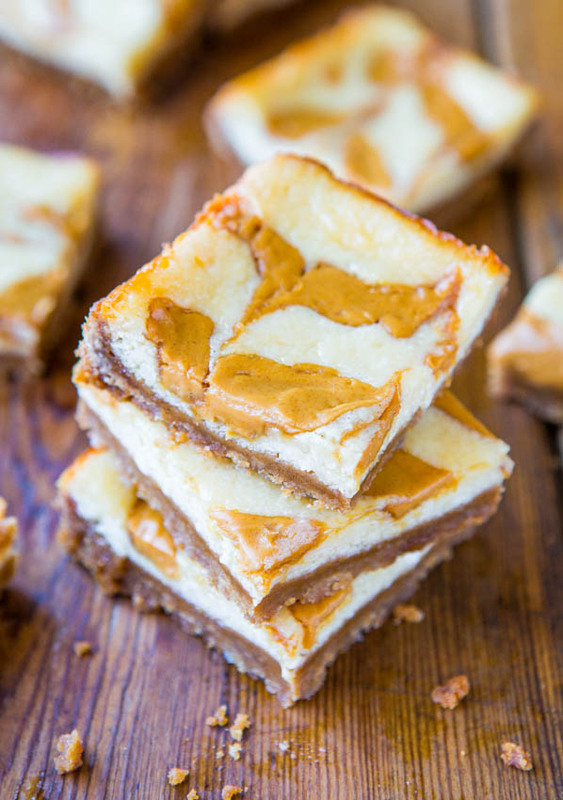 The cheesecake is topped with a sweet-yet-tangy sour cream glaze. The glaze, which adds flavor and moisture. 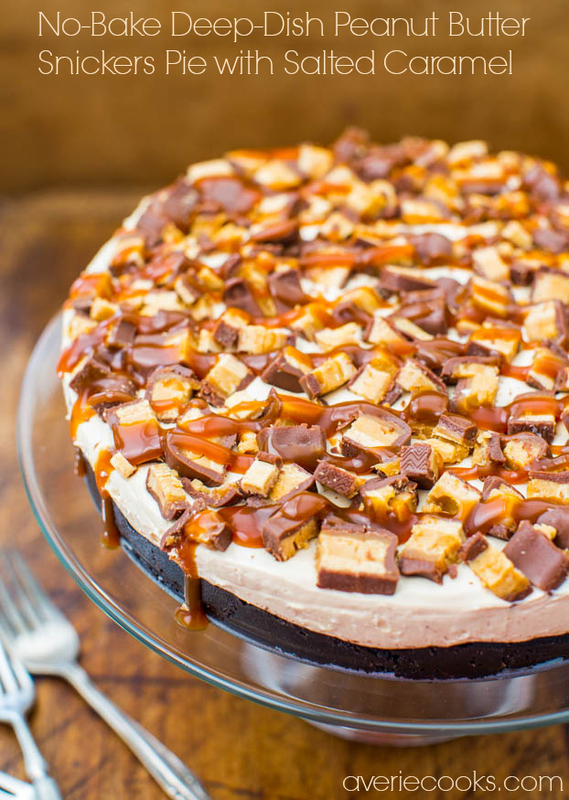 I couldn’t resist topping it with chopped chocolate, or try fruit or salted caramel. 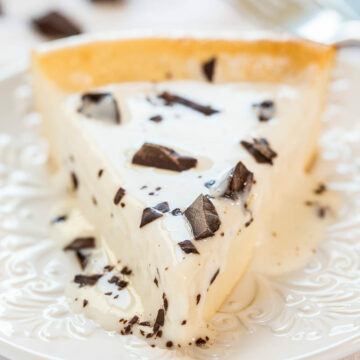 You can make the cheesecake a few days in advance and keep it refrigerated until you’re ready to serve it – one less thing to do the day of an event, party, or special dinner. Preheat oven to 350F and spray a 9-inch round pie dish very well with cooking spray. 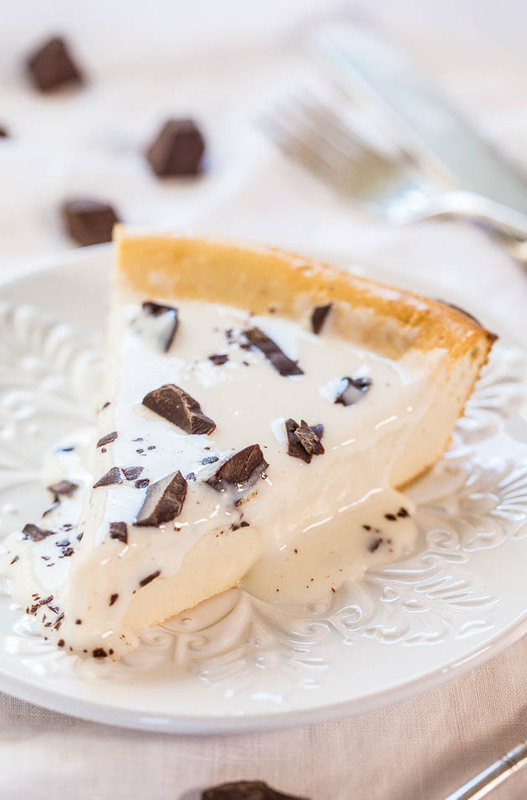 Make sure your pie dish is at least 2-inches deep (don’t use an 8-inch dish) because the cheesecake rises and puffs fairly dramatically in the oven and could overflow if your dish is too small or not deep enough. 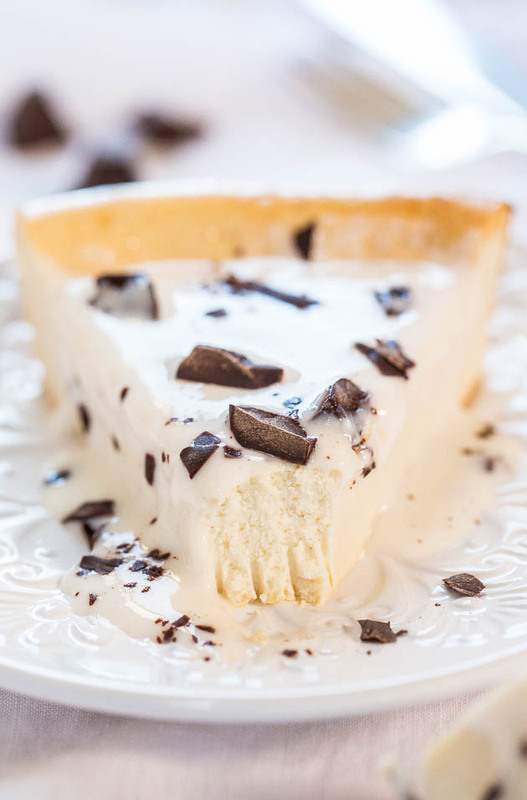 Cheesecake – To the canister of a blender, add the eggs, sugar, milk, Bisquick, vanilla, and blend on high speed until smooth, about 15 to 30 seconds. Add the cream cheese and blend on high speed until smooth, about 1 to 2 minutes depending on blender strength. Pour batter into prepared dish and place dish on a baking sheet (as insurance against overflow) and bake for about 40 to 45 minutes (I baked 45 minutes), or until a knife or toothpick inserted in the center comes out clean or with a few moist crumbs, but no batter. Cheesecake firms up as it cools and will fall a bit in the center, but the edges to remain raised. It’s okay if it cracks a bit because it’ll be covered with glaze. Place cheesecake on a wire rack to cool completely before glazing. Glaze – In a medium bowl, combine the sour cream, sugar, vanilla, and whisk until smooth. Evenly pour glaze over the cheesecake, being careful to keep glaze in the center portion and not over the raised crust edges. 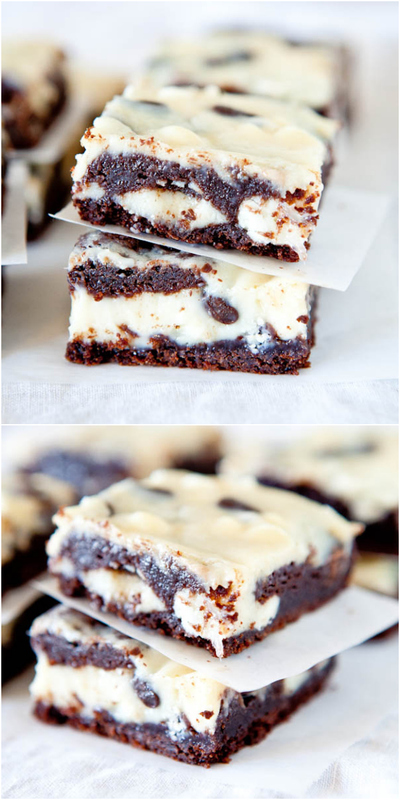 Evenly sprinkle with chocolate, slice, and serve. Or, cover with plasticwrap and keep in the fridge until ready to serve. Cheesecake will keep airtight in the fridge for up to 5 days. Hello! I also do not have a very good/powerful blender. Do you think I could use my stand mixer with similar results? I’m anxious to try this out!